Fitting door hinges is a common DIY job taken on by many people each weekend. If this is something you’ve got planned for the weekend or one evening then read on for some great tips on how to fit new door hinges. For the purpose of this how to guide we assume you have already prepared the recess for each hinge on the side of the door. 1) Selecting the correct gear and drill settings to drill the holes for the hinge screws is an important part of doing the job properly. 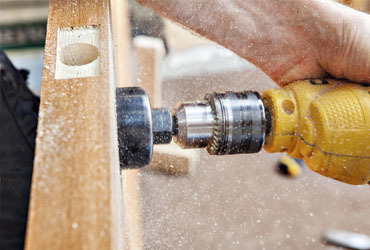 Using a cordless drill select a mid-speed gear (2 or 3) and then set the drill action to rotary only. 2) Place the hinges into the pre-cut notches and make sure the leaf of the hinge is aligned with the edge of the door. Mark the centre point of each screw hole using a pencil then remove the hinge and pre-drill each hole, ensuring the holes are drilled to the depth of the screws to be used whilst also drilled straight down. 3) Selecting the correct screw bit or screwdriver for driving the fixing screws through the hinge holes and into the doors will avoid damaging the screw heads and/or experiencing difficulties getting them all the way in. This can be done by placing the screwdriver tip or screw bit you shall be using into the screw head and checking for a good fit. The grip you have on a screwdriver is also important, a soft grip rounded handle is comfortable and allows for gentle pressure to be applied while driving the screws into the door. 4) If using a cordless drill or electric screwdriver then selecting the correct gear for driving the screws is also important, choosing a high speed setting usually results in chewed screw heads, so we suggest a low-speed gear with high torque. 5) Drive each of the fixing screws through the hinge holes and into the pre-drilled holes, leaving a couple of turns remaining on each screw until all screws are in place. Once you are at this point check the hinge is positioned correctly and still aligned with the edge of the door before tightening. 6) Finally check for any movement of the hinge by gently pushing and pulling on the projecting leaf. Congratulations you have now fitted the new hinges and can move on to hanging the door.